According to newspaper reports, Edward Elmore’s death sentence has been commuted to life in prison. Mr. Elmore has been on Death Row since 1982 for the murder of Dorothy Edwards and will not be executed because he has been found to be mentally retarded. The South Carolina Supreme Court has granted Quincy Jovan Allen a stay of execution, so that his attorneys can file a petition with the U.S. Supreme Court. Their concern is that in South Carolina inmates who plead guilty lose their constitutional right to a jury trial and are sentenced by judges. Mr. Allen is not expected to be given another execution date before March 16. On May 8, 2009, in revenge for the murder of police officer Thomas Harrison, the State of South Carolina carried out the legally sanctioned premeditated killing of Thomas Ivey. On May 7, a vigil for everyone afffected by the death of Thomas Harrison and the impending death of Thomas Ivey was held at Saint Thomas Moore Catholic Chapel, followed by a candle light vigil at the Governor’s mansion, asking for commutation of the death sentence to life. On the day of the execution protesters gathered in front of the South Carolina Department of Corrections Administration building on Broad River Road. This has been an ongoing effort for more than 20 years to ask the state “Do not Kill In Our Name.” It will continue until the death penalty is abolished in our state. The execution of Thomas Ivey by the State of South Carolina is scheduled for Friday, May 8. A peaceful Anti Death Penalty Protest is scheduled to start between 4 PM and 5 PM on 8 May in front of the Department of Corrections administration building at 4444 Broad River Road. The execution is scheduled for 6 PM. Signs will be available after 4 PM. A silent vigil is scheduled for Thursday evening, 7 May, from 7 PM to 8 PM at Saint Thomas Moore Catholic Chapel (behind the main building), 1610 Greene Street, Columbia, SC. This vigil is open to all sides and healing prayers or thoughts are for family and friends from both sides. A candle light protest at the Governor’s mansion is scheduled to start at 8:30 PM Thursday evening 7 May. Anyone is welcome to participate, although there has never been a commutation of a death sentence by our governor. Vigil for forgiveness and peace – I-126 to Huger St – left onto Blossom St. – left onto Pickens St. – right onto Greene St. — (St. Thomas Moore Student Center on right). Take I-126 into town onto Elmwood turn right onto Lincoln Street go 2 blocks to Governor’s mansion. I-20 West will come off at Exit 65 and turn right to the Department of Corrections (SCDC) on 4444 Broad River Road. I-20 East will also take Exit 65 but will turn left onto Broad River Road to SCDC. I-26 East take the Piney Grove Exit 104 turn left across bridge and continue until you come to the end then turn right go 1 or 2 blocks. I-26 West take Piney Grove Exit 104 turn right at light and continue until you come to the end then turn right go 1 or 2 blocks. Parking has been previously allowed at the Mexican Restaurant. But please be considerate as they have limited customer parking. They have excellent food as some of us can vouch. Also the Waffle House, one block away, has parking available with permission. Good place to take a break and get a beverage if necessary. 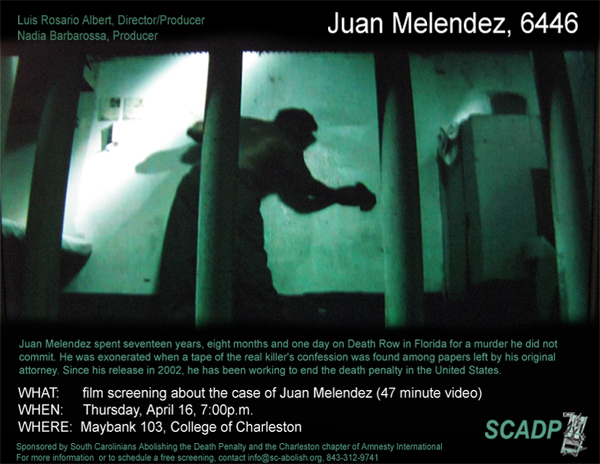 The state of South Carolina carried out the sanctioned murder of Luke Williams, III on the 20th of February 2009 in accordance with South Carolina laws. On the evening before the state execution, some of those who are involved with abolishing the death penalty attended a peaceful vigil for family and friends of both murdered and accused, asking for healing of those left behind. A candle light vigil at the Governor’s mansion followed, asking for commutation of the death sentence to life. On the day of the execution protesters gathered in front of the South Carolina Department of Corrections Administration building on Broad River Road.